Mansfield Town made two changes for today’s home clash with Barnet as the Stags looked to keep their faint play-off hopes alive. Mani Dieseruvwe returned to partner Matt Green up front while James Baxendale came into the midfield. Out from the side went Reggie Lambe and Mitch Rose, who were both on the bench. Also on the bench was Krystian Pearce, back from a three game ban but made to wait for a return. After playing a more experimental side against Notts County in midweek Martin Allen restored his side back to its usual full strength. STAGS: Shearer, Daniel, Collins, Tafazolli, Benning, Chapman, Blair, Thomas, Baxendale, Green, Dieseruvwe. Subs: Jensen, Rose, Pearce, Beardsley, Lambe, McGuire, Yussuf. BARNET: Stephens, Pearson, N’Gala, Dembele, Johnson, Yiadom, Togwell, Randall, Muggleton, Gash, Akinde. Subs: Nelson, Gambin, Batt, Alie, Taylor, Fonguck, Kyei. REFEREE: Andy Haines of Tyne & Wear. 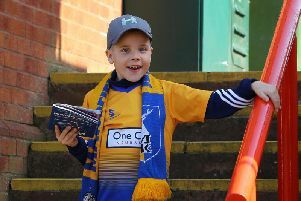 Keep in touch with today’s game and all things Mansfield Town 24/7 via our new Mansfield Town Live Scribble feed.